This appears to be the real deal. Set to have its debut sometime in 2015, either at Detroit or Geneva, is the Alfa Romeo 4C Spider. It was already previewed in concept form at last year’s Geneva show, and now we’re seeing the first images of the production-spec model, courtesy of the folks at Autoblog.it. The images you’re seeing, taken in Spain for promotional purposes, also show the North American model. Like its coupe sibling, the 4C Spider will be powered by a turbocharged 1.75-liter four banger that produces 237 horsepower and 260 lb-ft of torque. The 4C Spider concept has some exterior differences over the production coupe, such as slightly different headlights, exhaust and engine hood. Some of those changes, though now slightly modified, have made it to production. Also note the lower side vents. 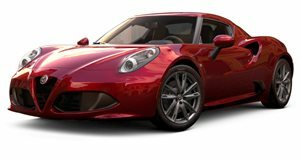 Alfa previously stated it had to make some body strengthening adjustments in order to better cope without the hardtop. Expect a slight weight increase as well. We’ll have complete details in the very near future.